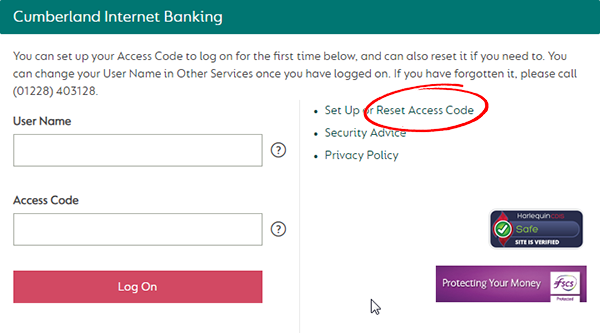 I've forgotten my Internet Banking log in details, what do I do? If you use our Mobile Banking app, you can find your user name next to your name on the main menu screen. Otherwise please call our Customer Service Team on 01228 403 141. What do I do if I've forgotten my debit card PIN? If you've forgotten your debit card PIN, you can request a replacement one by calling our Customer Service Team on 01228 403 141. We’ll send your replacement PIN by post, which you’ll receive within 5-7 working days (bank holidays will extend this period). You can change your PIN at an ATM. Simply insert your card into the machine, enter your current pin and follow the on screen instructions. The option to change your PIN will usually be found by clicking “Other Services”. Please choose a PIN that can't be easily guessed by others, and be careful not to share it with anyone else. You can update your address, email address and/or landline telephone number through your Internet Banking. Log onto Internet Banking, select 'Other Services' from the menu, and then 'Change My Details'. Follow the on-screen instructions, and ensure you have your mobile phone nearby, as we'll verify your request via a text to your registered mobile number. If you need to update your details, you can visit your local branch and a member of our team will assist you. You can scan or photograph a signed, written request to update your name, address, email or phone number and email this as an attachment to help@cumberland.co.uk . If you're unable to visit a branch, we can accept a request to change your details by post. Please include in any correspondence your full name, account number and signature. For any supporting documentation, please send the original or a Solicitor certified stamped copy. We cannot currently accept changes to your details over the telephone. We will require your full address including your postcode. You will need to include in any written communications your account number and a copy of identification (e.g. driving license, passport), or if you are changing your details in branch, please bring these along with you. If your account is a joint account, both signatories will need to change their details; however you do not have to come into branch together. We can't change the other account holder’s address without his or her written authority. We will require your new name along with proof of your name change (e.g. Marriage certificate, Decree Absolute, deed poll). What should I do if I've spotted a transaction I don't recognise? Read more about unrecognised debit card transactions. If you still don’t recognise the transaction, call us on 01228 403 141 with your account number, the transaction date and amount, and the name of the company the payment is to. You can also pop into your nearest branch and a member of the team will be happy to help you register. Remember, if you opened your account in branch, you may have already opted in for Internet Banking.